The “Sons of Anarchy” are riding Harley-Davidson Street Bobs into the sunset. Yes, this is the last season for the FX show about a nefarious gang and its leader who, for the past seven years, has been trying to extricate himself from gang life. And for those seven seasons Harley-Davidson has been sponsor and bike of choice for the group. The company has had some 100 bikes — across its portfolio — dedicated to the show, customized by a team of its own designers and S.O.A. producers, according to Dino Bernacchi, director of marketing communications for Harley-Davidson U.S.A. The iconic Milwaukee manufacturer is in the midst of capping its gang membership with a promotion dangling a private viewing party with S.O.A. 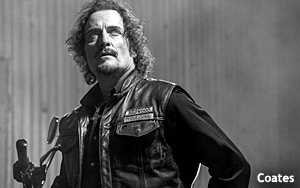 leads Kim Coates and Theo Rossi, and the chance to win an S.O.A. customized ride. Meanwhile, the company is continuing to up-shift on product integration efforts with Marvel movies and TV shows. For example, Harley has had motorcycles in "Captain America: The First Avenger"; "The Avengers"; "Iron Man 3"; "Thor: The Dark World"; the new Street 750 was featured in this year's “Captain America 2: The Winter Soldier," directed by Anthony Russo and Joe Russo, both Harley riders. And H-D bikes are in another Marvel property, ABC’s “Agents of S.H.I.E.L.D.” Parenthetically, Harley has also promoted the Street 750 with ice and dirt-track racing events associated with the X Games. While bikes like the Street 750 and Iron 883 were in "S.H.I.E.L.D." the company will see its futuristic concept, the Project LiveWire electric-powertrain bike, and Street 750 bike in the Joss Whedon-written/directed "Avengers: Age of Ultron," premiering May 1, 2015. Whedon also co-created "Agents of S.H.I.E.L.D." In the movie, the Project LiveWire is ridden by Black Widow, played by Scarlett Johansson. Bernacchi says Harley-Davidson will run a promotion around the film, details of which have not been finalized. "The second Avengers film is a cataclysmic moment because of the excitement and success of the first [film]. For both 750 Street and Project LiveWire it will be a 'holy bleep' moment. Version one was the third top-grossing film of all time, so for Street and LiveWire to be part of it will be exciting." As for S.O.A., Bernacchi said Kurt Sutter, creator of the FX show (and a rider), "reached out to us and pitched the idea. It was an easy ask for us. The main cast, the sustaining characters all ride." Through the past three or four seasons of the show, Harley has run a promotion driving people online by offering limited-collection "while supplies last" Harley S.O.A. stickers. "They come and do lots more browsing than just get the sticker. This year, it crashed our server with 40,000 people asking for stickers in a 24-hour frame, just from a post on the S.O.A. Facebook page." And Harley will return to the Terminator franchise for the next installment, "Terminator: Genisys," which will feature the Fat Boy nameplate. "It's cool because they reached out to us," says Bernacchi. Harley is currently promoting the LiveWire via a road show called "The Project LiveWire Experience" comprising a fleet of 33 Project LiveWire bikes in two trucks criss-crossing the country giving riders a chance to throw a leg over the bikes and ride them. The point of the program is to get rider impressions to see if it's doable, drive social buzz, and promote the brand as future oriented.